Six weeks at CCS has taught me more of our country’s governance than eight years of reading the newspaper ever did. This was my first experience interning at a Think-Thank and I was really unsure of what to expect from it. To begin with, the issue I was working with wasn’t really one in which I had any prior knowledge of – street vendors. My very first assignment was to critique the Delhi Government’s rules for the implementation of the Street Vendors Act, 2014. Though the rules were largely in consonance with the law, they inadvertently harms the interests of the street vendors in certain crucial sectors – for example, they severely undermine the independence of the Town Vending Committee, the empowered body which forms the centerpiece of the legislations governing street vendors. Whether deliberately or not, the rules have sought to keep these TVCs subservient to the Government - allowing the Government to appoint up to 60% of the TVC members on its own terms and dissolve the TVC under poorly defined circumstances. What is the point of setting up a separate Town Vending Committee, if it will only be dominated by the Government? An independent TVC is imperative to the effective implementation of the Street Vendors Act. In the process of going through this Act, we also chanced upon a glaring flaw within it, something which has escaped the notice of most. The Act has called for a Grievance Redressal and Dispute Resolution Committee headed by a person who has been a Civil Judge or a Judicial Magistrate. It also allows for parties to appeal against the verdict of this Committee to the Municipal Corporation. But herein lies the irrationality of this all – a civic officer/bureaucrat of the Municipal Corporation cannot overturn the decision of a Committee headed by a practiced and experienced judge. This not only undermines judicial independence but it also contravenes the doctrine of separation of powers enshrined in the Constitution. It was alarming for me to see such careless lawmaking lead to such astonishing errors in the law. Another important case where I worked was this particular judgment in the Jaipur High Court, dated the 12th of February 2015. On the face of it, the judgment seemed to have been in the interests of the street vendors – it had prodded the Government into implementing the Act safeguarding their rights and called for a halt on all eviction. And yet, the municipal authorities in Jaipur have exploited one of the High Court’s orders which had called for the declaration of temporary no-vending zones as a safety measure – the Jaipur Municipal Corporation has gone on to declare almost half the city’s land are off limits for street vendors. A closer look into the verdict and its aftermath revealed a saga of cleverly-crafted lies, flouted deadlines, half-hearted attempts to implement the Street Vendors Act and sheer indifference to the plight of the street vendors. There have been several takeaways for me in this entire journey, the foremost being that I have begun to realize, for the first time, what really is wrong with our country and why. The primary difficulty is that the Government has a free hand to do whatever it likes - flout it owns rules, disregard deadlines set by the judiciary, make most absurd lies in the courtroom and yet, it gets away with it all. The Jaipur verdict also made me aware of the fact that a proactive and well-intentioned judiciary may be well and good, but when it is coupled with an administration so indifferent to the plight of large sections of society, it may end up creating more problems than it solves. As they say – the road to hell is paved with good intentions. These six weeks have also opened my eyes to how passing legislation is just the first step in solving the myriad ills plaguing the country and not the final solution, as it is commonly misunderstood to be. It is the means to an end and not an end in itself. Without political will to give effect to a law, it remains only a piece of paper. Ravi came to Delhi – an entirely new place for him from Mumbai (where he has lived all his life). He came within a week of his X grade board examinations. Myself and his mother shifted our base to Delhi for six weeks. I was little anxious on the first day – 06th of May to settle him in as it is his first place of work at a very young age of 15. However the first 5 mins of interaction with you made me and Ravi feel at home. I was amazed at the corporate-like induction and immediately, offering all the necessary infrastructure like work place desk etc.and introduction to the project. I felt amazed at the seriousness and professional approach of CCS to internship and that too for an young kid. I was also amazed at the way CCS builds confidence among interns and at the trust and empowerment given to interns. It was apparent to me on the first day, when CCS entrusted the job of assessing a government act and regulation to Ravi and one is usually done by the senior law students. I am sure that the confidence and trust of CCS team in an young intern made him give his best to a real life subject. Ravi was often praising the informal work culture and flexibility and at the same time and at the same time, the focus on result oriented work culture at CCS. Even there was a farewell planned for Ravi – again amazed at the overall approach to internship at CCS and treatment of an young intern more like a colleague rather than a student. 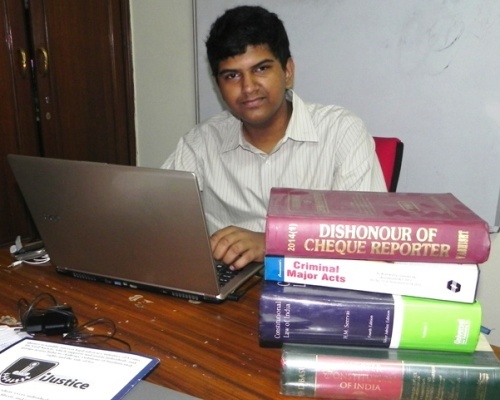 Ravi came enriched with a great degree of learning on interpreting govt. regulations and acts and the process and role of judiciary in government act implementations. And topped the Maneckji Cooper school and one of the best scores across schools. We immensely thank you and CCS for giving a platform for a rich learning experience through a real life project for Ravi. Ravi was really excited at working as an intern at CCS and often was saying his keen desire to keep his association with CCS and the great social contribution of CCS think tank.